Avengers: Endgame is an upcoming American superhero film based on the Marvel Comics superhero team the Avengers, produced by Marvel Studios and set for distribution by Walt Disney Studios Motion Pictures. It is the direct sequel to 2018's Avengers: Infinity War, a sequel to 2012's Marvel's The Avengers and 2015's Avengers: Age of Ultron, and the 22nd film in the Marvel Cinematic Universe (MCU). The film is directed by Anthony and Joe Russo with a screenplay by Christopher Markus and Stephen McFeely and features an ensemble cast including Robert Downey Jr., Chris Evans, Mark Ruffalo, Chris Hemsworth, Scarlett Johansson, Jeremy Renner, Don Cheadle, Paul Rudd, Brie Larson, Karen Gillan, Danai Gurira, Bradley Cooper, and Josh Brolin. In the film, the surviving members of the Avengers and their allies work to reverse the damage caused by Thanos in Infinity War. The film is scheduled to premiere in Los Angeles on April 22, 2019 before being theatrically released in the United States on April 26, 2019, in IMAX and 3D. After half of all life in the universe was eliminated due to the actions of Thanos in Avengers: Infinity War, the remaining Avengers and their allies must reassemble to revert those actions in one last stand. An ex-U.S. Air Force pilot whose DNA was altered during an accident, which imbues her with the powers of superhuman strength, energy projection and flight. Co-screenwriter Christopher Markus stated that Danvers' powers are on a scale that has not previously existed in the MCU and likened her personality to Rogers', "which is sort of a person who's right and knows they're right and doesn't really want to hear it when you tell them they're wrong". Larson filmed her scenes for Endgame before beginning work on her solo film Captain Marvel, which was released first to introduce the character to audiences. Captain Marvel directors Anna Boden and Ryan Fleck were present for the filming of her scenes in Endgame, and gave Danvers's characterization in the film their blessing. A member of the Guardians of the Galaxy who is a genetically-engineered raccoon-based bounty hunter and mercenary, and is a master of weapons and battle tactics. Sean Gunn was again the stand-in for Rocket during filming, with his acting and expressions serving as motion reference for the character. An intergalactic despot from Titan who collected the six Infinity Stones to inflict his will on all of reality. Co-director Joe Russo said that after the events of Avengers: Infinity War, "[Thanos has] succeeded in the thing he has set out to do. He's done. He did it. He's retired." In addition to providing the voice for the character, Brolin performed motion capture on set. Frank Grillo, Tessa Thompson and Winston Duke reprise their roles as Brock Rumlow / Crossbones, Valkyrie and M'Baku from previous MCU films. Hiroyuki Sanada and Katherine Langford have been cast in undisclosed roles. Avengers co-creator Stan Lee has a posthumous cameo in the film. Additionally, several actors whose characters were killed during the events of Infinity War have been announced to reprise their roles in Endgame, including Benedict Cumberbatch as Dr. Stephen Strange, Tom Holland as Peter Parker / Spider-Man, Chadwick Boseman as T'Challa / Black Panther, Paul Bettany as Vision, Elizabeth Olsen as Wanda Maximoff / Scarlet Witch, Anthony Mackie as Sam Wilson / Falcon, Sebastian Stan as Bucky Barnes / Winter Soldier, Tom Hiddleston as Loki, Pom Klementieff as Mantis, Dave Bautista as Drax the Destroyer, Zoe Saldana as Gamora, Chris Pratt as Peter Quill / Star-Lord, Letitia Wright as Shuri, and Evangeline Lilly as Hope van Dyne / Wasp. In October 2014, Marvel announced a two-part sequel to Age of Ultron, titled Avengers: Infinity War. Part 1 was scheduled to be released on May 4, 2018, with Part 2 scheduled for May 3, 2019. In April 2015, Marvel announced that Anthony and Joe Russo would direct both parts of Avengers: Infinity War, with back-to-back filming expected to begin in 2016. Also in the month, Kevin Feige said the films were titled as two parts of a single film "because they [have] such shared elements", but he would not actually describe them as "one story that's cut in half. I would say it's going to be two distinct movies." By May 2015, Christopher Markus and Stephen McFeely signed on to write the screenplays for both parts of the film. The following May, the Russos revealed that they would be retitling the two films, to further remove the misconception that the films were one large film split in two, with Joe stating, "The intention is we will change [the titles], we just haven't come up with [them] yet." In July 2016, Marvel removed the film's title, simply referring to it as Untitled Avengers film. Feige and the Russo brothers indicated the title was being withheld because it would give away plot details for this film and Infinity War. Principal photography began on August 10, 2017, under the working title Mary Lou 2, at Pinewood Atlanta Studios in Fayette County, Georgia, with Trent Opaloch serving as director of photography. The film, along with Infinity War, were shot using IMAX/Arri 2D cameras, thus marking the first time that a Hollywood feature film was shot entirely with IMAX digital cameras. Also in the month, filming occurred in The Gulch area of Downtown Atlanta, near the Five Points MARTA station, and Piedmont Park. Feige stated that the films were originally scheduled to be filmed simultaneously but instead decided to shoot them back-to-back explaining, "We're doing them one right after another. It became too complicated to cross-board them like that, and we found ourselves—again, something would always pay the price. We wanted to be able to focus and shoot one movie and then focus and shoot another movie." Anthony Russo originally felt it made more sense to shoot the films simultaneously due to financial and logistical reasons considering the large number of cast members, even though each part is its own distinct film, and suggested that "some days we'll be shooting the first movie and some days we'll be shooting the second movie. Just jumping back and forth." Production wrapped on January 11, 2018, although additional filming took place in Dutchess and Ulster counties in New York in June 2018. Reshoots began by September 7, 2018, and concluded on October 12, 2018. More reshoots occurred in January 2019. Evans and Hemsworth each earned $15 million for the film. 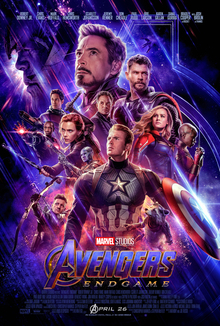 On December 7, 2018, with the release of the film's first trailer, the title was revealed to be Avengers: Endgame, while also moving its release date in the United States to April 26, 2019. Visual effects for the film were created by Industrial Light & Magic, Weta Digital, DNEG, Framestore, Cinesite, Digital Domain, Rise, Lola VFX, Cantina Creative, Capital T, Technicolor VFX, and Territory Studio. Jeffrey Ford and Matthew Schmidt served as the film's editors. In June 2016, Alan Silvestri, who composed the score for The Avengers, was revealed to be returning to score both Infinity War and Endgame. The Russos started working with Silvestri on the score in early November 2018, and the score was completed in late March 2019. The marketing campaign for Endgame is the largest for any Marvel Studios film, surpassing $200 million and besting Infinity War's $150 million campaign. Promotional partners include Stand Up to Cancer, MasterCard, Ulta Beauty, the Audi e-tron GT Concept car (which is also featured in the film), McDonald's, Geico, Coca-Cola, Google, General Mills, Hertz, Ziploc, Oppo Mobile, and Synchrony Financial. A year prior to the film's release, Germain Lussier of io9 spoke on the approach Marvel might have to take in marketing the film, given the end of Infinity War, which sees many established characters die. He questioned if those characters would appear on posters and in toy campaigns, and if the actors portraying them would participate in press events leading up to the film's release. Lussier felt Disney and Marvel could focus on the original Avengers team members, who make up the majority of the living characters, but noted it would be more beneficial to show the return of the dead characters, which would "build a mystery and curiosity about how they come back. It could create a whole new level of interest about the film while having all the stars front and center, as they should be". In June 2018, Feige spoke to this, stating that these dead characters would not be featured in any marketing for the film, though the decision regarding that could change. He presented a behind-the-scenes video from the film at CineEurope, and said that the official marketing campaign for the film would begin at the end of 2018 with the announcement of the film's title then. In early December 2018, ahead of the first trailer's release, Graeme McMillan of The Hollywood Reporter spoke to the "fevered anticipation" surrounding it. McMillan felt what was so remarkable about the anticipation, was that it was mostly "fan-created, without noticeable direction from Marvel or the filmmakers involved" and that the amount of knowledge surrounding the film without any type of promotion was "a kind of brand awareness that most studios would kill for". Because of this, McMillan urged Marvel not to release any trailers for the film since "the advanced level of enthusiasm that's already out there for the movie... is only likely to build as it gets closer to" the film's release. That said, he added that the eventual release of the trailer would take away the "Schrödinger's cat-esque position... it currently enjoys" as it was "almost guaranteed to disappoint fans, who have by this point built up their own personal trailers filled with whatever moments are essential to their enjoyment of a good teaser". The first trailer for the film was released on December 7, 2018. Dustin Sandoval, vice president of digital marketing for Marvel Studios, stated the marketing team "actively made the choice not to include the title or hashtag of the movie in our trailer posts so fans could see it at the end reveal without it being spoiled". Richard Newby, also of The Hollywood Reporter felt, while not much new was revealed in the trailer, it "offers a somber glimpse of a universe made unrecognizable" and lets the viewer "sit, rightfully so, with the ending of Avengers: Infinity War and our questions of loss". Newby also noted how the trailer "calls back to beginnings of the MCU... [as] the visual language used in the trailer does a great service by highlighting these characters' humble beginnings", and concluded it leaves viewers with "just as many questions as we had before". Austen Goslin of Polygon pointed out that the title not only references a line Doctor Strange tells Tony Stark in Infinity War, but also a line spoken by Stark in Avengers: Age of Ultron. Goslin, who felt this was "probably [not] an accident", said, "The scene surrounding this line in Age of Ultron is one of the most important ones in the movie. Things look dark, and the group of heroes face an enemy they don't think they can defeat." As such, the Endgame trailer "mirrors this perfectly" and "shows us that the Avengers' two most prominent characters are who they've always been: Iron Man, a pessimist who keeps fighting no matter how hopeless things look, and Captain America, an optimist who believes that nothing is hopeless when the world's heroes fight together". The trailer was viewed 289 million times in its first 24 hours, becoming the most viewed trailer in that time period, surpassing the record of Avengers: Infinity War (230 million views). The trailer also set a record for Twitter conversation for a film trailer in the first 24 hours generating 549,000 mentions. By January 3, 2019, BoxOffice revealed their "Trailer Impact" metric service indicated approximately 77–78% of people surveyed who viewed the Endgame trailer in the past three weeks expressed interest in seeing the film. In the three weeks it was measured by "Trailer Impact", it was number one for all, and had the top two percentage of respondents express interest in seeing the film since the service's introduction in March 2018. The second trailer for the film, along with the theatrical release poster, was released on March 14, 2019. The poster, featuring 13 characters, had 12 of those actors listed on the top-billing, with Danai Gurira excluded. Despite Gurira's name appearing in the poster's bottom billing block along with Benedict Wong, Jon Favreau, and Gwyneth Paltrow (none of whom were featured on the poster), her exclusion in the top billing prompted criticism from fans. Petrana Radulovic of Polygon noted how an actor is credited on the poster "is a complex process" and "the omission of Gurira in the top billing was less of a conscious decision than the ramifications of dealing with agents, fees, and movie star demands." However, later in the day Marvel Studios released an updated poster with Gurira's name in the top billing. The second trailer was viewed 268 million times in the first 24 hours, becoming the second most viewed trailer in that time period, behind the film's first trailer. Avengers: Endgame is scheduled to make its world premiere in Los Angeles on April 22, 2019. It is scheduled to be released in China, Australia, and parts of Asia and Europe on April 24, 2019, in the United Kingdom on April 25, 2019, and in the United States on April 26, 2019, in IMAX and 3D. It was originally scheduled to be released in the United States on May 3, 2019. In late December 2018, Endgame was named the second-most anticipated 2019 film by IMDb, the most anticipated blockbuster of 2019 according to the ticketing service Fandango, and the most anticipated overall film by Atom Tickets. Due to the high demand when pre-sale tickets became available in the U.S. on April 2, 2019, customers on both Atom Tickets and Fandango experienced long wait times and system delays, while AMC Theatres' website and app crashed completely for several hours. The same day, Fandango announced the film became its top-selling pre-sale title for the first 24 hours, topping Star Wars: The Force Awakens' previous record in just six hours. Atom said it was also its best selling first-day film (outselling Aquaman by four-times), and Regal Cinemas reported that Endgame had sold more tickets in its first eight hours than Infinity War did in its entire first week. On April 4, industry tracking projected the film would gross $200–250 million domestically during its opening weekend, although some insiders saw those figures as conservative and expect a $260–300 million debut. In China, pre-sale tickets became available on April 12 and sold a record one million tickets in just six hours, and also outsold Infinity War's first 24 hour total within the first hour. ^ "Avengers: Endgame (2019)". British Board of Film Classification. April 12, 2019. Retrieved April 12, 2019. ^ "'Avengers: Endgame". Disney.com.au. Archived from the original on February 9, 2019. Retrieved February 7, 2019. ^ Schmidt, J. K. (March 20, 2019). "Disney and Marvel Studios Reveal Official 'Avengers: Endgame' Synopsis". ComicBook.com. Archived from the original on March 20, 2019. Retrieved March 20, 2019. ^ a b c Mithaiwala, Mansoor (October 28, 2017). "Robert Downey Jr. Announces Avengers 4 Return". Screen Rant. Archived from the original on November 4, 2017. Retrieved November 4, 2017. ^ Barnhardt, Adam (April 6, 2019). "Marvel Studios Is Officially Calling Clint Barton Ronin in 'Avengers: Endgame'". ComicBook.com. Archived from the original on April 7, 2019. Retrieved April 7, 2019. ^ Lussier, Germain (April 9, 2019). "Why Captain Marvel Has on More Make-Up in Endgame Than Her Solo Movie". io9. Archived from the original on April 9, 2019. Retrieved April 11, 2019. ^ McLean, Pauline (April 9, 2019). "Karen Gillan on Tupperware Party, Inverness and Avengers". BBC News. Archived from the original on January 17, 2017. Retrieved April 10, 2019. ^ a b c d Radulovic, Petrana (March 14, 2019). "Marvel changes Avengers: Endgame poster after fan outcry over Danai Gurira's credit omission". Polygon. Archived from the original on March 14, 2019. Retrieved March 14, 2019. ^ a b Damore, Meagan (August 22, 2017). "Avengers 4 Set Photos Capture Iron Man Character's Return". Comic Book Resources. Archived from the original on August 23, 2017. Retrieved August 22, 2017. ^ Schmidt, J. K. (December 22, 2018). "'Avengers: Endgame' Directors Explain How Thanos and the MCU Have Changed". ComicBook.com. Archived from the original on December 24, 2018. Retrieved December 24, 2018. ^ Sharf, Zack (March 26, 2019). "Tessa Thompson Confirmed for 'Avengers: Endgame,' Weighs In on Valkyrie–Captain Marvel Fan Buzz". IndieWire. Archived from the original on March 26, 2019. Retrieved March 26, 2019. ^ "Oscar Isaac, Winston Duke, and Emily King". Late Night with Seth Meyers. Season 6. Episode 88. March 18, 2019. Event occurs at 31:38. NBC. Retrieved April 5, 2019. ^ a b Sandwell, Ian (September 29, 2017). "Another Guardians of the Galaxy star confirms they'll be coming back for Avengers 4". Digital Spy. Archived from the original on October 1, 2017. Retrieved September 30, 2017. ^ McMillian, Graeme (March 26, 2019). "Marvel Prepares to 'Avenge the Fallen' in New 'Avengers: Endgame' Posters". The Hollywood Reporter. Archived from the original on March 26, 2019. Retrieved March 27, 2019. ^ a b Cabin, Chris (January 14, 2016). "'Captain America: Civil War' Directors on Landing Spider-Man, 'Infinity War' Shooting Schedule". Collider. Archived from the original on January 14, 2016. Retrieved January 14, 2016. ^ Hullfish, Steve (April 29, 2018). "Art of the Cut with Avengers – Infinity War editor, Jeffrey Ford, ACE". Pro Video Coalition. Archived from the original on December 22, 2018. Retrieved December 22, 2018. ^ Davis, Brandon (March 22, 2019). "Avengers: Endgame Score Officially Complete". ComicBook.com. Archived from the original on March 23, 2019. Retrieved March 26, 2019. ^ a b D'Alessandro, Anthony (April 17, 2019). "'Avengers: Endgame' $200M+ Promo Campaign Is Marvel's Biggest Ever, Surpassing 'Infinity War' & More". Deadline Hollywood. Retrieved April 17, 2019. ^ a b Newby, Richard (December 7, 2018). "The Tragic Symmetry of 'Avengers: Endgame'". The Hollywood Reporter. Archived from the original on December 7, 2018. Retrieved December 7, 2018. ^ Sandoval, Dustin [@DustinMSandoval] (December 7, 2018). "It's probably gone unnoticed[....]" (Tweet). Archived from the original on December 10, 2018. Retrieved December 10, 2018 – via Twitter. ^ a b Breznican, Anthony (March 14, 2019). "Marvel updates Avengers: Endgame poster to include Danai Gurira's name". Entertainment Weekly. Archived from the original on March 14, 2019. Retrieved March 14, 2019. ^ Martinez, Jose (March 17, 2019). "Latest 'Avengers: Endgame' Trailer Becomes Second-Most Watched Trailer Ever in First 24 Hours". Complex. Archived from the original on March 20, 2019. Retrieved March 20, 2019. ^ Ridgely, Charlie (April 15, 2019). "'Avengers: Endgame' Being Called "One of the Biggest Movies of Our Lifetime," Theater Chains Adding Additional Showtimes". ComicBook.com. Archived from the original on April 15, 2019. Retrieved April 15, 2019. ^ Tartaglione, Nancy (March 28, 2019). "'Avengers: Endgame' China Release Set On April 24; $800M+ WW Opening In Sight?". Deadline Hollywood. Archived from the original on March 28, 2019. Retrieved March 28, 2019. ^ Merueñas, Mark (March 16, 2019). "Pinoys among those who get to watch 'Avengers: Endgame' two days ahead of rest of the world". MSN. Archived from the original on April 3, 2019. Retrieved April 3, 2019. ^ Knight, Lewis (April 17, 2019). "Avengers Endgame: UK release date, trailer, run time, cast and latest news". Daily Mirror. Retrieved April 18, 2019. ^ Hayes, Dade (December 31, 2018). "'Avengers: Endgame,' 'Captain Marvel' Rated By Atom Tickets As Most Anticipated 2019 Film Releases". Deadline Hollywood. Archived from the original on January 2, 2019. Retrieved January 2, 2019. ^ D'Alessandro, Anthony (April 2, 2019). "'Avengers: Endgame' Presales Set First-Hour Records; Ticket Sites Crash – CinemaCon". Deadline Hollywood. Archived from the original on April 2, 2019. Retrieved April 2, 2019. ^ "Marvel Studios' Avengers: Endgame advance ticket sales outpacing Avengers: Infinity War" (Press release). Regal Cinemas. April 2, 2019. Archived from the original on April 3, 2019. Retrieved April 6, 2019 – via PRNewswire.com. Within eight hours of going on sale, Avengers: Endgame has doubled all the first week sales for Avengers: Infinity War. ^ Rubin, Rebecca. "Box Office: Avengers: Endgame Headed for Epic $200–$250 Million Domestic Launch". Variety. Archived from the original on April 5, 2019. Retrieved April 4, 2019. ^ D'Alessandro, Anthony (April 4, 2019). "'Avengers: Endgame' U.S. Opening Weekend Projections: Can Sequel Get Close To $300M?". Deadline Hollywood. Archived from the original on April 5, 2019. Retrieved April 4, 2019. ^ Pedersen, Erik (April 12, 2019). "'Avengers: Endgame' China Presales Blast Off To Unprecedented Levels". Deadline Hollywood. Retrieved April 12, 2019.